Kevin Fell and Derek Thorne from HOZA will bring an interactive performance entitled, Peace of a Decade, to Holy Name on Friday, February 15. Presentations will take place at 1:10 – 2:10 for grades K-3 and at 2:20-3:30 for grades 3/4 –8 in the gym. 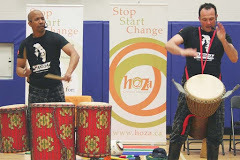 Kindergarten to grade 8 will participate in drumming, singing, and dancing. Students will explore the values of peace, solidarity, cooperation, equality and respect for all human beings. They will be challenged to consider the needs of present and past generations, and how they will make their voices heard. All are welcome to attend. Previous Story Previous post: Sacrament of First Reconciliation – Grade 2’s on Jan 15 at 7:00 pm!